The Iowa Conference is hosting Katherine Parker, a United Methodist Missionary, presently serving in Nepal. Katherine has frequent flyer miles having served at the Asian Rural Institute in Japan, Practical Farmers in Ames, IA, with the Community Health and Agricultural Development program in Cambodia before working with the Health Team of the United Mission to Nepal. Ms. Parker has considerable experience with agricultural programs that include farming, rice co-ops, water, sanitation and hygiene and working with livestock. A native of California her undergraduate and Master's degrees are from educational institutions there. She has deep roots in United Methodism due to grandparents, an aunt and cousins who have served as United Methodist clergy. From a young age, Katherine wanted to be involved in mission work. She was in Iowa to itinerate in 2016. We offer you and your church the opportunity for Katherine to share her stories. If your church members are interested she also has a “cooking class” to learn how to prepare traditional Nepali food and offers a sewing class to make washable menstrual pads. Katherine does not have transportation so it would be your responsibility to transport her from one event to another. For long distances you might split the travel with the other host church. Your church/group is asked to take an offering, not to give to her, but sent to the Iowa Conference treasurer, designated: #399 Parker Itineration to help defray other travel costs. Any funds remaining will be sent for her salary support. Additional biographical information about Katherine is found here. Her Advance Special Salary Support number is #15187Z. You are welcome to attend any of these speaking events to hear Katherine share her mission story as part of the Health Team of the United Mission to Nepal, focusing on water, sanitation and hygiene. 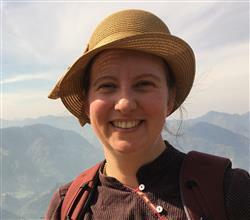 Her work takes her to many rural villages working with mountain families. For more information contact Beverly Nolte, beverly.nolte@gmail.com.